SK Ulu Daro students working on laptops during lessons. SITUATED 150km away from Sibu is the small town of Daro in the district of Mukah, Sarawak where the majority of its residents work as farmers and fishermen. 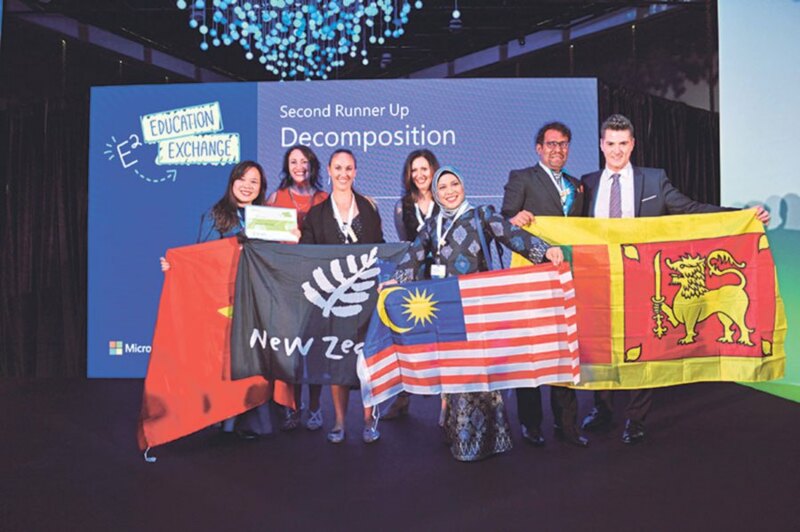 Wan Juliana Wan Asharuddin and the team she coached are the second runner-up under the Decomposition category for the Educator’s Challenge. Although Internet connectivity at the school was an issue and there were a minimum number of devices in the lab, he saw the transformation in his pupils when he introduced them to technology. “They were much more focused and it was obvious that they were having more fun learning while taking turns to explore the wonder of computers. “The experience had sparked curiosity in them. That was when I slowly implemented technology in my lessons,“ he added. His journey in applying technology in his lessons was just the beginning as he ventured further when he was introduced to the Microsoft Innovative Educator (MIE) programme. The MIE programme has attracted more than 150,000 educators globally who have joined the Microsoft Educator Community (MEC). Having learnt the fundamentals of applying technology to education, they use Microsoft tools such as Windows, Office 365 and Skype in class. To be a certified MIE, the educator must earn 1,000 points by completing online courses, contributing lesson plans, participating in Skype activities and connecting with other educators across the globe. “I was introduced to the MIE programme at a course in Pusat Kegiatan Guru. I was among nine other teachers who have been using technology in their lessons. We were asked to nominate ourselves to be MIE Experts (MIEEs). I was among four teachers from Daro selected to attend a local forum,“ added Khairul Azlan, sharing his first exposure to the programme. Teachers who become skilled at integrating technology into the classroom can self-nominate to join the MIEE programme. If selected, they will be a part of the exclusive programme to lead innovation in education and advocate and share their thoughts on the effective use of technology in education with peers and policymakers. At the technology showcase for classroom solutions during E2. (From left) Wan Azrina Muhamad Zuki, Nur Hayati Shahrome, Khairul Azlan Mohd Faizul, Mohamad Haniff Hasan and Wan Juliana Wan Asharuddin (standing). This year, Khairul Azlan and three other Malaysian teachers were chosen as MIEEs based on the technology-infused lesson plans they had submitted earlier. The other teachers were Wan Azrina Muhamad Zuki (from SMK Kubang Kerian, Kelantan), Mohamad Haniff Hasan (SK Jasin, Melaka) and Nur Hayati Shahrome (Maktab Rendah Sains MARA Kuala Kubu Baru). 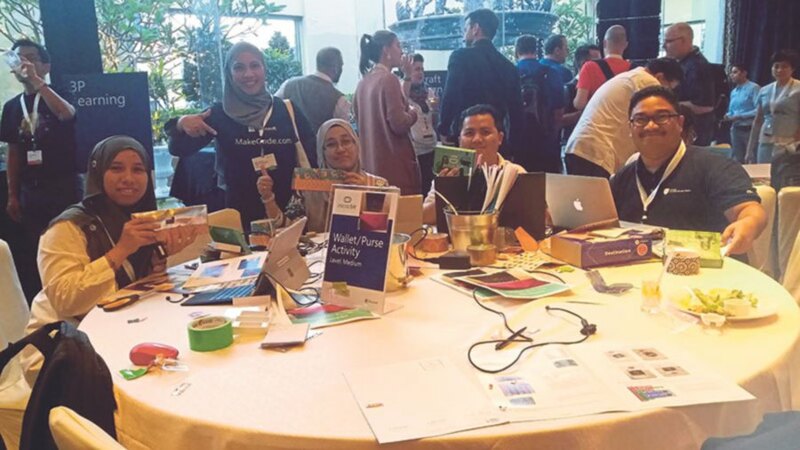 As MIEEs, they have the chance to attend Microsoft Education Exchange (E2), an annual three-day event. At the E2, MIEEs share how they integrate Microsoft technologies into the classroom in innovative ways. They also celebrate the achievements of educators who combine content, pedagogy and technology in exemplary ways to prepare students for success in the digital age. This year‘s E2 event was held in Singapore last month. Trying to relate a topic on statistics with a global current issue in a lesson gained Wan Azrina the chance to attend E2 as an MIEE. 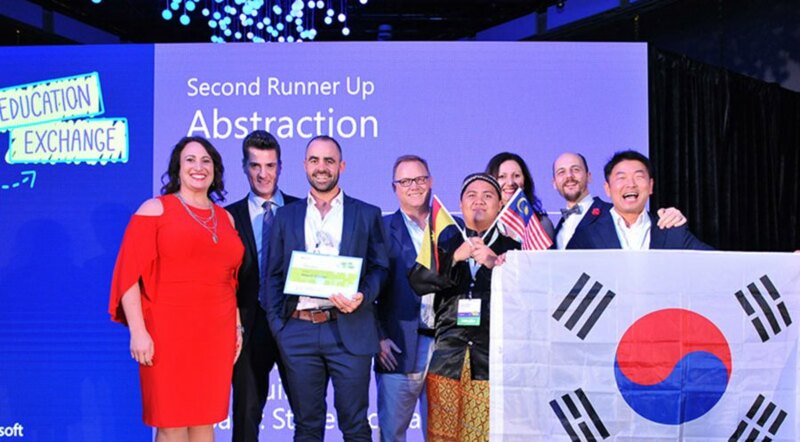 Khairul Azlan Mohd Faizul (fifth from left) and his team members receiving the second runner-up award under the Abstraction Category. Together with them is Anthony Salcito (second from left). In the project-based learning approach, students had to create a poster using Microsoft Office, design 2D and 3D food waste tanks using Microsoft Paint 3D and develop a computer game on the same theme. They then used the Virtual Learning Environment platform to place their work to promote awareness on food waste to other students. On the other hand, English teacher Mohamad Haniff went big with his lesson to teach primary schoolchildren language and instil entrepreneurship. He was inspired by A. J Juliani (author of Empower: What Happens When Students Own Their Learning), www.geniushour.com and Karen A. Kruger, one of the teachers who promotes Genius Hour, a movement that allows students to follow their passion and explore creativity in the classroom. “The lesson is based on the deep learning framework and implemented using an experiential learning model by David Kolb, an inquiry-based learning method by Jerome Bruner and an independent learning model. “Students were given an opportunity to determine their passion by answering several inquiry-based questions. Then they researched into their interest and planned a project before they shared all these with the public in a showcase event. Through this lesson, he said, his students were not just learning English, they were also using the language in real life. They felt the importance of mastering the language and this motivated them to learn more. A computer science teacher with six years of teaching experience, Nur Hayati got her students to predict their examination results using Excel. 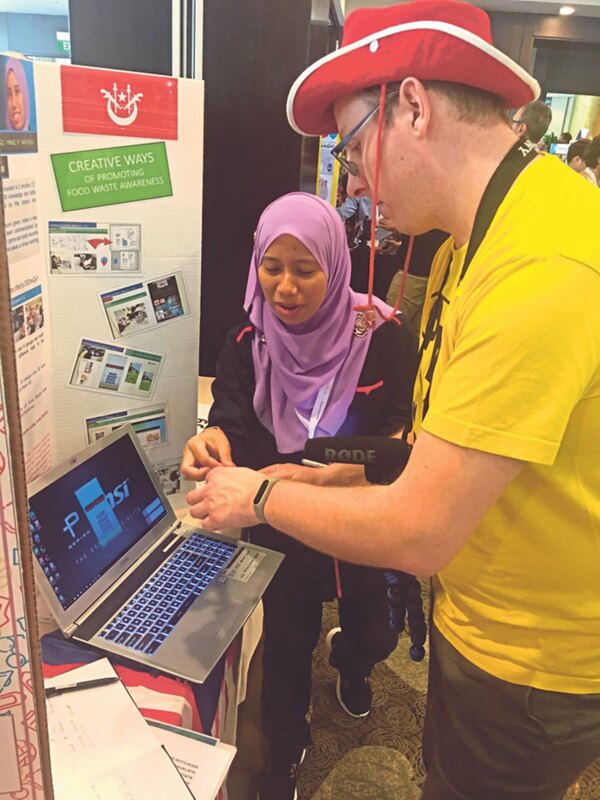 Wan Azrina Muhamad Zuki explaining her lesson to another educator at the Learning Marketplace. At E2, these teachers showcased their activities with their students at the Learning Marketplace and took home inspiring ideas from others. For the first time, a Malaysian was selected as an MIE Fellow to represent the country at E2. MARA creative technology and multimedia division assistant director Wan Juliana Wan Asharuddin was chosen for her dedication in working with Microsoft and educators to transform classroom learning. The E2 is an event to not only recognise and celebrate educators but also to collaborate and share their experiences with MIEEs from all over the world. Participants are divided into 53 teams to compete in the Educator‘s Challenge. Each team selected and hacked an existing lesson plan (chosen from five given) according to one of the four categories of computational thinking: Abstraction, Pattern Recognition, Decomposition and Algorithmic Thinking. “Computational thinking is a way of pondering on problems similar to mathematical and scientific thinking,“ explained Wan Juliana, who has coached MARA teachers to become MIEEs since 2016. She added, decomposition, for instance, is useful in helping to determine the unknown as the process involves breaking down a complex problem or system into smaller and more manageable parts. “Decomposition means breaking things that make up the larger problem into smaller pieces. For example in teaching the order of adjectives, there is a pattern to construct a sentence according to the correct order,“ she added. As a MIE Fellow, Wan Juliana was also given the responsibility to coach a team to hack a lesson during E2. The team members from Vietnam, Sri Lanka and New Zealand whom she coached were the second runner-up for the Decomposition category at E2. Judging was based on four categories: Communication, Innovation, Collaboration and Equity. For Khairul Azlan, his trip to Singapore will not be the end of his journey in transforming education in class after his experience working with the all-male team of teachers from New Zealand, France and South Korea. For the challenge, his team was second runner-up in the Abstraction category for the Educator‘s Challenge. “And prior to leaving for Singapore to attend E2, my school‘s Internet connection was upgraded. It‘s time to explore further,“ said Khairul Azlan, beaming with happiness. For decades, learning institutions have been touched by technology‘s influence — networking and computer labs, software applications, the Internet, gaming and social networking. Even though technology is an accelerator, it does not enable much change in the classroom. Microsoft education vice-president Anthony Salcito said: “It is not really about technology but it is how you structure your role as an educator. “Technology alone cannot build 21st century skills in students without the power of the educator and there is impact when both technology and the teacher are brought together, and recognised for their achievements. He added that an educator‘s job is not just about delivering content. In inspiring students to pursue their passion, they must also encourage them to use resources appropriately to make the right decisions. “An educator must further enable students to make these connections; students should not only use resources that are provided by teachers in class. “When the role of learning expands far beyond the textbook or the 50 minutes of a science lesson, students can explore and be curious. Taking advantage of all the resources for classroom projects expands the role of learning than ever before. “A great teacher is not necessarily one who uses technology every day in class. He embraces the reality that technology exists in school and outside it. Teachers do not need to be experts in technology to be powered by this new way of learning. While teaching as a job is secure from replacement by technology and not amenable to automation, Salcito said the approach must change to prepare students for the Fourth Industry Revolution.